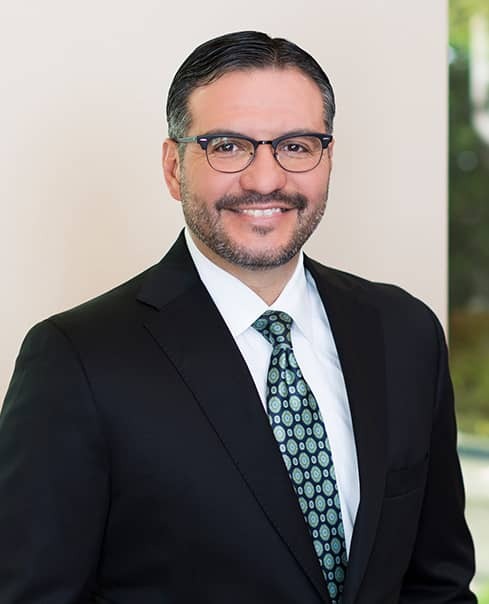 Francisco “Frank” Guerra, IV is a capital partner in Watts Guerra, LLP and has served as the managing partner of the San Antonio office since 2001. Mr. Guerra received his Bachelor of Arts from Texas A&M University in 1992, where he served as Commander of Squadron 15 and was the first Hispanic Commander of the elite Ross Volunteer Company. He then attended the University of Texas School of Law, where he obtained his Doctor of Jurisprudence in 1996. Mr. Guerra has served on the Malpractice, Premises & Products Pattern Jury Charge Committee for the State Bar of Texas. Since joining Watts, Frank has litigated, tried and arbitrated cases all over the country. During law school at the University of Texas, he served as Intern to the Honorable Justice John Cornyn, Supreme Court of Texas, in 1995. He also had the honor of serving as an intern to the late Professor Charles Alan Wright, who was considered to be the foremost authority in the United States on Constitutional law and federal procedure and was the coauthor of the 54-volume treatise, Federal Practice and Procedure with Arthur Miller. Frank was a member of the ATLA Mock Trial Regional Champion, State Finalist, and National Quarter-Finalist Teams in 1995 and 1996. He was subsequently inducted as a National Member of The Order of Barristers. After graduating from law school, Mr. Guerra joined the law firm of Allen, Stein, Powers, Durbin & Hunnicutt, where he practiced insurance defense and civil litigation law. He managed the Rio Grande Valley Office of that firm from 1999 to 2001 and spent his time trying lawsuits every week in front of South Texas juries. One of the first cases he tried was a double death case against Mikal Watts in Webb County, Texas. After the hard fought battle, they forged a friendship that would last forever. Frank eventually joined the San Antonio office of Harris & Watts (a predecessor firm to Watts Guerra LLP) in 2001. As examples, he served as co-counsel with Mikal Watts in Garza vs. Holiday Inn, Castro vs. Ford, Garcia vs. Ford, English vs. Bay, Ltd., Rincon vs. Shell, and Strange vs. Penhall, and Longview vs. Huff, in which the jury rendered significant verdicts. Frank was also lead counsel in Pribble vs. Sunbelt Rentals et. al, which produced the largest verdict in 2012 in the state of Arizona. Frank also handles high profile mass tort cases. In 2013, Frank Guerra and Mark Fassold conducted a seven-week medical device trial in state court in San Diego that ultimately resulted in a confidential settlement of the “Cold Therapy” docket. Mr. Guerra was designated as co-lead counsel in the GMO Corn Lawsuit against Syngenta, a case involving the premature release of a genetically modified corn seed, where Watts Guerra represents over 50,000 individual farmers against the pharmaceutical company, Syngenta. Mr. Guerra is Board Certified in Personal Injury Trial Law by The Texas Board of Legal Specialization and is also fluent in Spanish.